Most PC based MIDI sequencers, drum machines and other common tempo producing devices provide metronome outputs of poor quality. For years, recording industry professionals had relied on the clean, easily heard "clicks" produced by high quality digital metronomes. Now, with so much music production being conducted by computers and sequencers, musicians and engineers make do with the beep-beep of Macintosh speaker outputs or MIDI triggered percussion samples as metronome signals. A device called the "MIDI CLICK KICKER" has been developed to produce high quality click tracks. The MIDI CLICK KICKER is a MIDI triggered source of clean, powerful metronome clicks like those produced by professional digital metronomes. 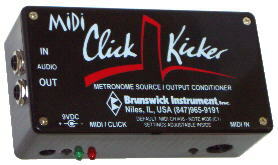 The MIDI CLICK KICKER is designed for use with sequencing and recording systems that generate MIDI data to trigger an external metronome "click". The MIDI CLICK KICKER can also convert low level or inferior sounding metronome outputs from other sources to clean, powerful clicks with it's audio trigger input facility. The unit consists of a small "black box" with 1/4" unbalanced audio input and output jacks, a MIDI IN jack and an external wall transformer type power supply. The MIDI metronome data output of your tempo producing device (computer, sequencer, etc.) is connected to the MIDI CLICK KICKER's MIDI IN jack. MIDI channel and note number settings are fully adjustable by the user. The unit is velocity sensitive and also offers pre-programmed diminished click sounds providing two different ways the user can produce an accented metronome if desired. An existing metronome or click track audio output can be converted to clean, powerful pulses by connecting it to MIDI CLICK KICKER's audio input jack. MIDI CLICK KICKER will trigger on each incoming signal and produce a click output without delay. In addition to driving typical line level audio inputs, the MIDI CLICK KICKER output may directly drive loudspeakers with impedance ratings of 8 ohms or more. Manufacture of the CLICK KICKER products has been discontinued as of March 2017. Existing units can likely be repaired if they are sent to us. Contact us for further detail. THANK YOU to all CLICK KICKER purchasers for a nearly 30 year run.